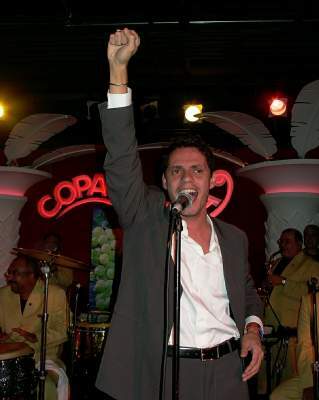 El Gran Combo de Puerto Rico and Marc Anthony played at the Copacabana Salsa Congress which took place at the Copacabana Nightclub in New York City on August 28, 29, & 30, 2003. Showcasing the best in both music and dance the Copacabana Congress attracted more than 7 thousand Salsa lovers over the 3-day weekend. With the participation of top international and New York area dancers, nightly dance performances and shows, and daily workshops by world class instructors there was much to experiance. 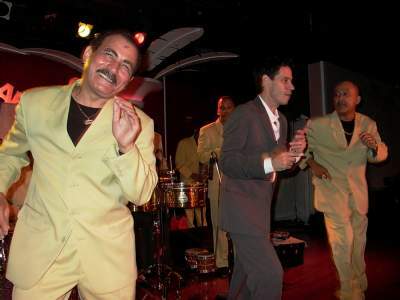 The focus was on couples Club-Style Social Dancing during the pulsating live performance by El Gran Combo. The dance couples were up on 5 stages that were distributed about the club with 2 being added as appendages to the stage where the musicians were playing. This allowed a clear view of the dancers that were performing and with all 5 platforms going constantly all night long it was the ultimate Salsa fix. 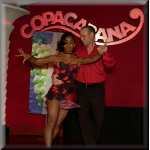 Also the Copa Girls and the Cabana Boys, which already include many of New York's top dancers, were on hand to excite the audience with their dance moves. These photographs were taken by J. Fernando Lamadrid on August 30, 2003 and are copyright 2003 www.justsalsa.com. All rights reserved. Your feedback is welcome. Enjoy! Copyright © justsalsa.com 1999, 2000, 2001, 2002 & 2003 NYC. All Rights Reserved.